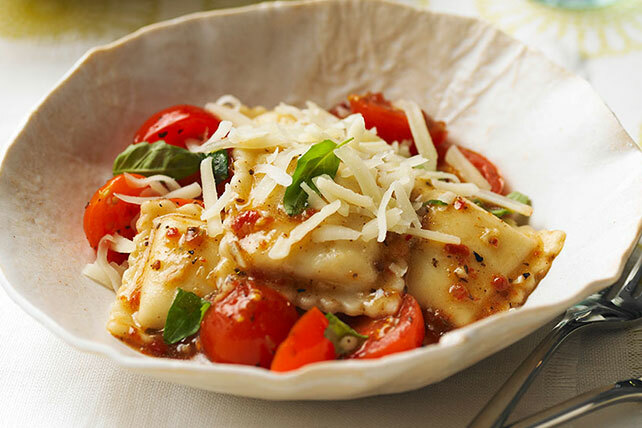 Take your ravioli recipe up a notch with cheese, cherry tomatoes, garlic and more. Sometimes simple is best with this Fresh Tomato Ravioli Recipe! Meanwhile, heat dressing in large skillet on medium-low heat. Add garlic; cook 2 min. Stir in tomatoes; cook 2 min. or until heated through, stirring occasionally. Drain pasta. Add to tomato mixture with basil; mix lightly. Top with cheese. Top with 4 crumbled cooked OSCAR MAYER Bacon slices before serving.